The main reason I took a side trip to Washington, DC was to see this exhibition, Diaghilev and the Ballets Russes: When Art Danced with Music. Ever since I saw some of the costumes at the Wadsworth Atheneum in Hartford, Connecticut in 2006, I’ve been interested in how the costumes of the Ballets Russes influenced the fashions of the 1910s and 1920s. So when I heard that this exhibition was to be held at the National Gallery of Art, I was pretty excited. Originally organized by and shown at the Victoria and Albert Museum in London, it was a big hit there in 2010. I’m not going to beat around the bush. 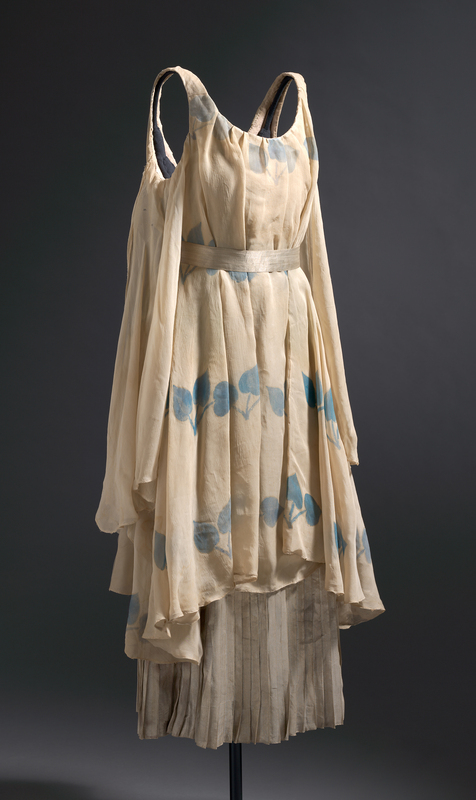 This is a must-see exhibition if you are interested in the art, music, ballet, and fashion of the 1910s and 1920s. The story of how Serge Diaghilev assembled the best of the avant-garde to transform ballet is a fascinating one, and the National Gallery tells it in a very engaging manner. The exhibition is multilayered, with not just the costumes and props that are on exhibit, but using them in combination with the original drawings, artworks that were an influence, historic photographs, and film clips of the actual dances (but not from the original 1909-1929 productions because Diaghilev did not permit filming). I’m not going to try to tell the entire story of the Ballets Russes, as it would make this post much too long. For a brief overview, the V&A site has a nice page that was made for the original exhibition. There is a one hour film that shows continuously that one needs to view before entering the exhibition. It tells the story of how Serge Diaghilev, who was not a dancer, not a musician, nor an artist, was able to put together his incredible ensemble. Born into a wealthy Russian family that lost its fortune due to the political upheavals in early 20th century Russia, he left his home in St. Petersburg in 1906, and eventually decided that what Western Europe needed was a good dose of Russian culture. He was just the man to supply it. 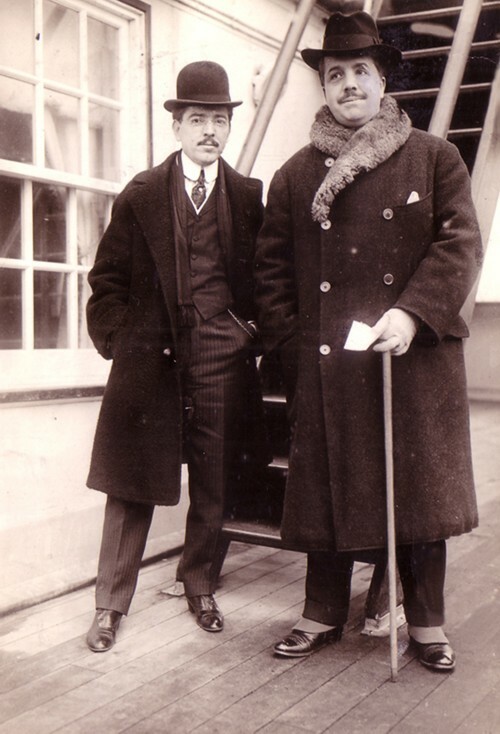 In Russia, Diaghilev had worked as a promoter of the arts, and had even published a magazine, World of Art. He was friends with many of Russia’s artists composers and performers, so he was in a good position to call upon their talents. From the beginning of the Ballets Russes in 1909, he had the support of Russians such as artists Léon Bakst and Natalia Goncharova, composers Sergei Prokofiev and Igor Stravinsky, and dancers Anna Pavlova and Nijinsky. The Ballets Russes was a tremendous hit, and even during WWI the troupe continued working by touring North and South America. I find it amusing that the Ballets Russe never performed in Russia, but the people of Knoxville, Tennessee (about 90 miles from my home) were able to attend a performance in their town in 1916. 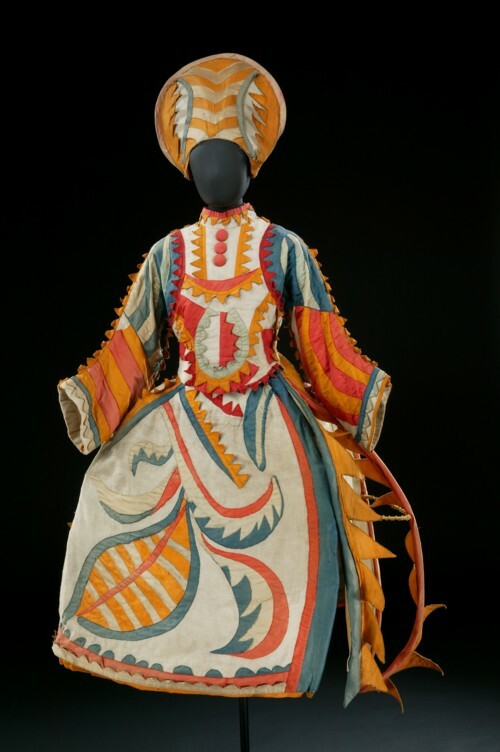 After the war, Diaghilev was able to bring in more artists to work on sets and costumes, including Picasso, Sonia and Robert Delaunay, and Matisse. Coco Chanel was also involved, making the costumes for Le Train bleu which were sporting clothes. In 1929 Serge Diaghilev died. He had never accumulated a fortune, as all the money the company made was put into the next production. It was said that Chanel paid for his funeral and burial. After the death of Diaghilev, the Ballets Russes disbanded and the dancers went on to be stars in other ballet companies, often using the old Ballets Russes dances and costumes. A group called the Ballets Russes de Monte Carlo was formed in 1938 by some of the former members. 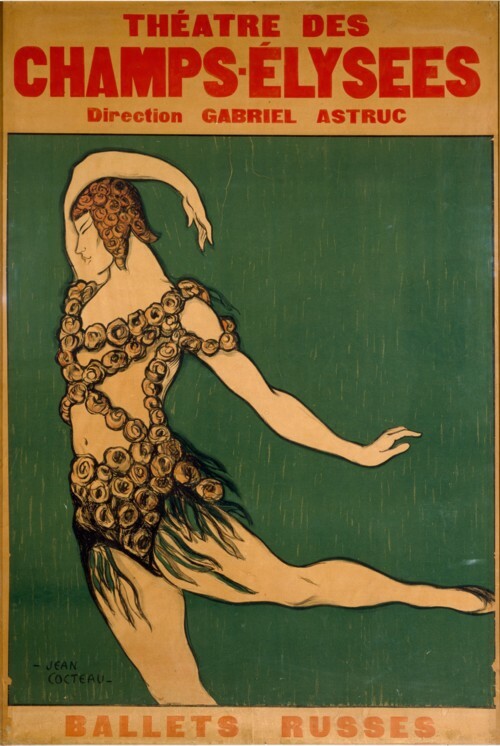 The influence of the Ballets Russes was far-reaching and many of the writings I’ve read credit Diaghilev with pretty much inventing the modern ballet. I’m indebted to the press office of the National Gallery of Art for the use of these photos of the exhibits. Photos were not allowed, but these are much nicer than what I would have been able to take. Most can be enlarged by clicking. Please do not put these photos from my site on Pinterest nor on Tumblr. This costume was originally designed for dancer Vaslav Nijinsky but this version is later, from 1922. The costumes often had to be replaced due to the hard wear on them. 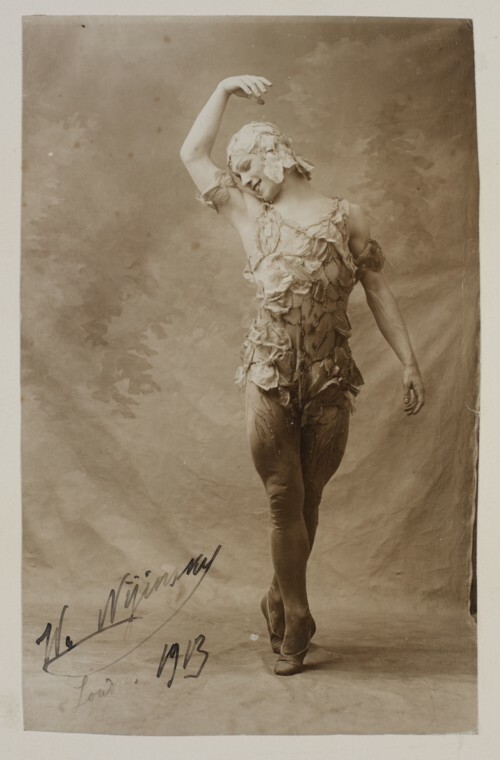 This is Nijinsky wearing the costume as it was made for him in 1911. 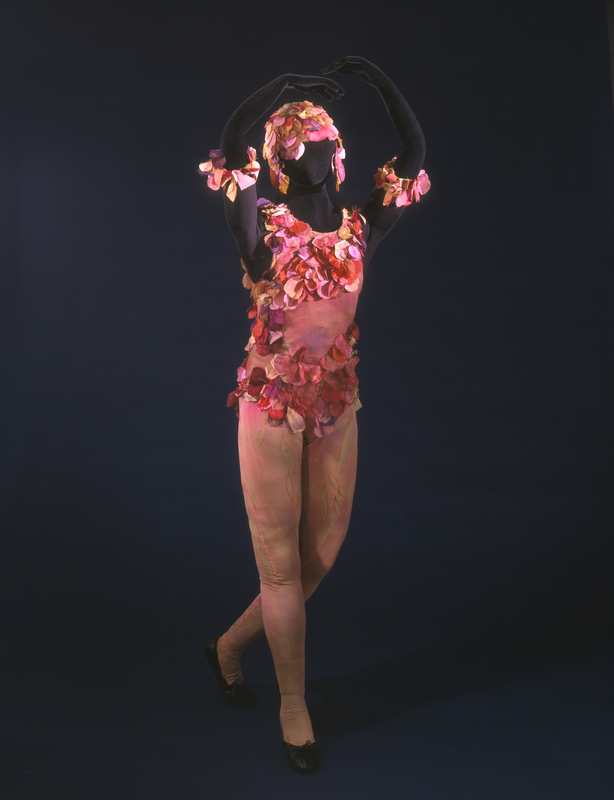 The petals were applied with him wearing the costume. And here we see the costume as rendered by artist Jean Cocteau in a poster for a performance of The Spirit of the Rose. A lot of thought and care went into all the costumes, not just those of the principal dancers. 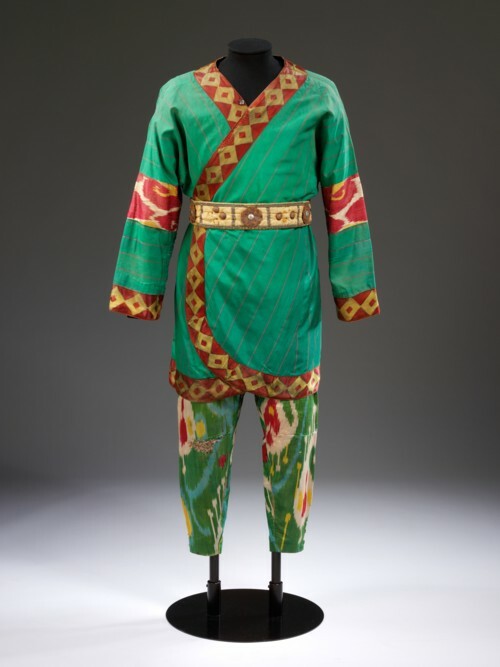 The designer, Nicholas Roerich, sourced authentic ikat fabrics for various Polovtsian dancers’ costumes, whose clashing colorful costumes were an important part of the overall spectacle. The Afternoon of of a Faun was danced and choreographed by Nijinsky, and was an even bigger venture into the avant-garde. The costume for the Faun was mainly painted onto tights and body. This costume was worn by one of the Nymphs. The ballet represented characters on a Greek vase brought to life, and the movements were intentionally two-dimensional. The first audiences to see it were understandably confused. Along with the costumes and artwork, the National Gallery has little theaters set up throughout so that many of the dances as interpreted by more modern dance companies can be viewed. The Afternoon of the Faun still looks very modern. It was the ballet, Scheherazade, in 1910 that set off the fad for Orientalism in fashion. Paul Poiret always claimed that the Ballets Russes had no influence on him whatsoever, but I think he was protesting a little too loudly. © 2013 Artists Rights Society (ARS) New York/ADAGP, Paris. 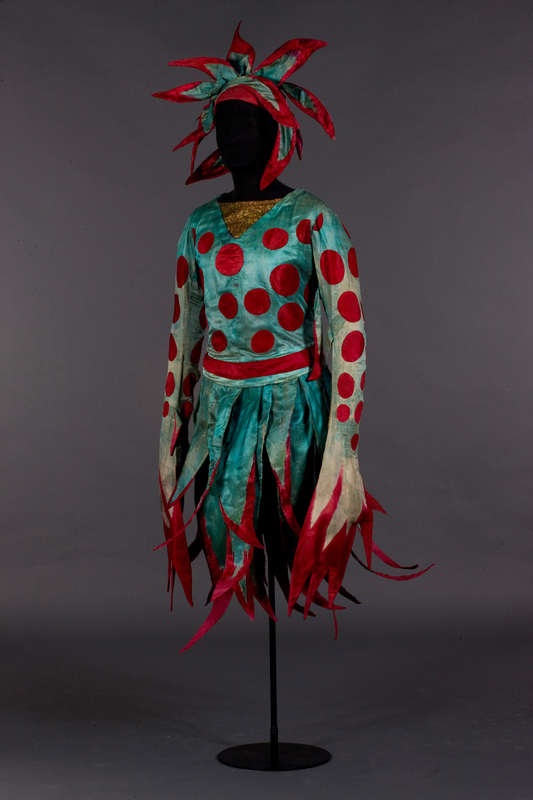 If you are familiar with the work of Sonia Delaunay, then you can see her theories of color at work in this costume. The exhibition also has the original sketch, which I forgot to request, but you can see it on the Metropolitian website. 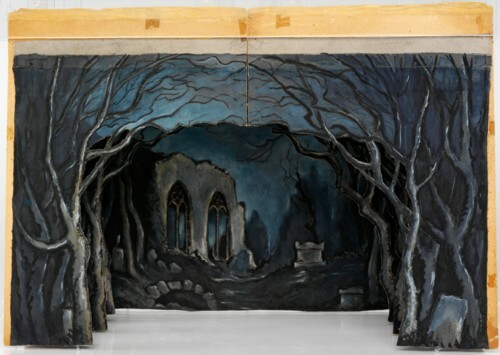 Just so you will know that it was not just costumes, this is a three-dimensional model for the set of Les Sylphides. Click to see how wonderful it is. My favorite object was not a costume, but was this back cloth from The Firebird. Even if you have not clicked to enlarge any of the other photos, you must see the larger version. When I stepped into the room where this cloth was hung, my breath was literally taken away. It is so large that the museum had to raise the ceiling in the room. To get a better look at its size, here is a photo with people standing before it. This is just a very small taste of the exhibition. I spent hours, absorbed in the world of Diaghilev and his wonderful Ballets Russes. Then I had to buy the exhibition book. Today the costumes and set materials from the Ballets Russes are scattered across the world in museums and in private collections. You can look at the credits of the photos I’ve used to see a few of the collections that have Ballets Russes material. For years, many of the costumes and sets had been in storage, and in 1967 the first of many auctions was held. Over the next several decades the Victoria and Albert Museum amassed the largest collection of artifacts, but other museums such as the Wadsworth Atheneum and the National Gallery of Australia have noteworthy collections. You might be interested that the Australian collection was mostly bought in 1973 by an eleven-year-old boy. Well, sort of. So pleased you got to see this exhibition. I saw it at the V&A and it was indeed fascinating and delightful. I’m curious about the Poiret comment though. I seem to remember in London that several of his outfits were showcased as part of the exhibition, suggesting it was very much accepted that he had been influenced by the Ballet Russes. Interesting to hear that he denied it at the time! He denied it in his autobiography, which was written in 1931. 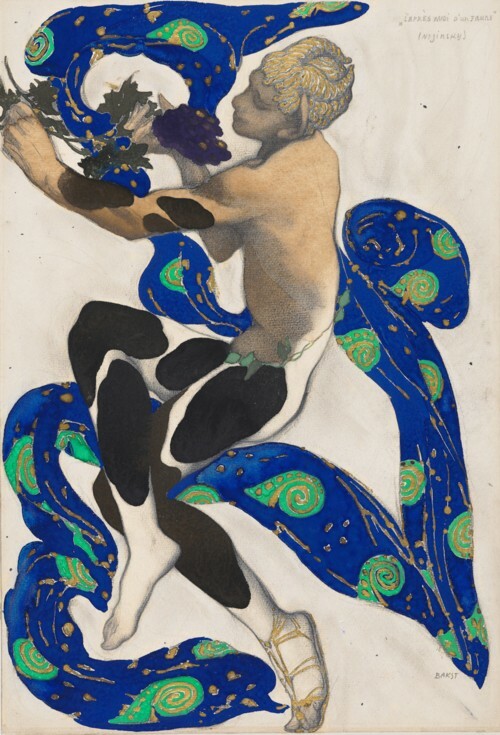 It is accepted today that he had to have been influenced by Bakst’s work. 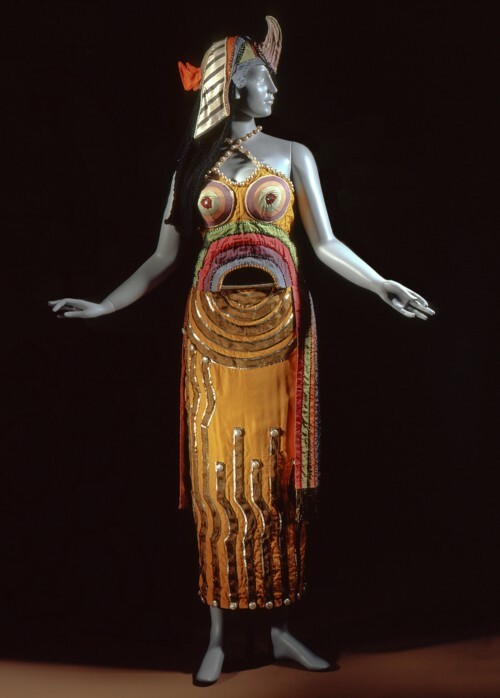 Unfortunately, the Poiret outfits were not included at the exhibition. There are other differences, including a rare film clip of a Ballets Russes rehearsal that has been discovered after the show at the V&A. Back in the early 1980’s I think it was – it might have been earlier – I went to a preview of one of the costume auction sales. It was held in London at Chelsea Town Hall on the Kings Road. It was an unearthly experience. Rails of ballet costumes. Musty smells. The rails were heaving with the weight. What added to the atmosphere was the number of retired and elderly former ballet dancers who had come to see the costumes. I know they were dancers by their posture and the way they positioned their feet. It was quite a moving experience. I would love to see the exhibition. What an incredible experience. Could it have been as early as 1973? The book mentions an auction on the the Kings Road in that year. The former Diaghilev ballerinas would go to the early auctions so they could pose dance students in modeling the costumes for the sale. Oh it could be. I’d just started my course at the Central School of Art & Design. Crikey, that is a long time ago Lizzie! Have to get a copy of the book. I love the design work and the overlapping influences. Wow, this sounds like a spectacular exhibition! I’ve recently learned more and have become very interested in fashions of the 1920s (as you know from my last blogpost) and have always loved the ballet. it was so interesting to read more about the Ballet Russes, thanks for summarizing for us. And, how cool, that the 11 yr old and his incognito father bought all those costumes for the Australian museum! I hope to be able to take a short holiday and visit Washington DC for this exhibit. I do think you would enjoy it, plus there is so much to do and see in DC. I’ve never been. Do you know for how long the exhibit will be there? I am going to look it up today, hopefully, it lasts till July, when I am off work. Yes, it is there until Sept. 2. Must be fantastic… i had a fantastic time reading your summary! Thank you! Oh, good! I’m always afraid of going on and on and on whenever I really like something. I saw this exhibition at the V&A, and it was great to revisit it through your experience. The Firebird back cloth was displayed in a similarly dramatic way – I turned a corner and, oh my! I’m fascinated by Christina’s recollection of the early costume sale too – what an amazing sounding experience. I’m glad it affected you in the same way. What a stunning piece! There were several of the ikat costumes, with a crazy mix of colors and designs. Just imagine that on the stage! Many years ago I saw an exhibition of some of the costumes in Australia, so it would be wonderful to see them combined with the V&A ones. The V&A collection is amazing, not just costumes, but also photos and other documentation. I have been hoping/waiting for this post! 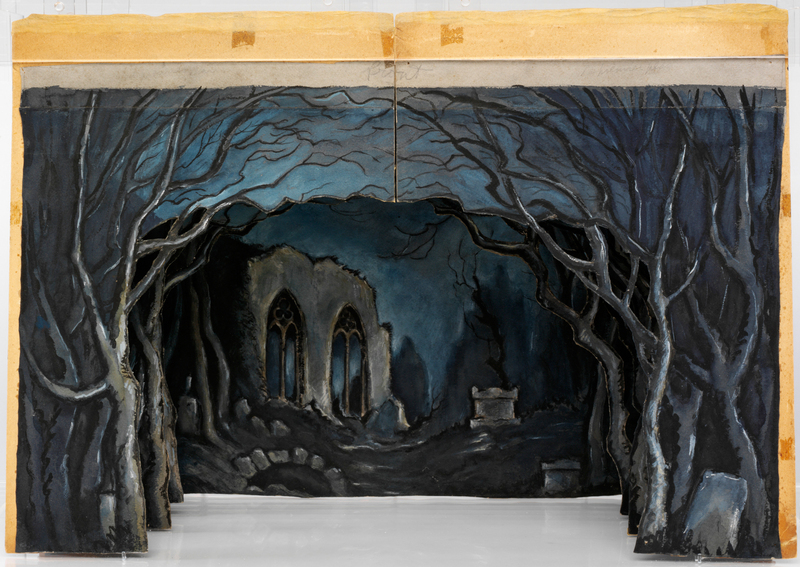 I think I might actually be more in love with the backdrop art than with the costumes…though those are incredible. 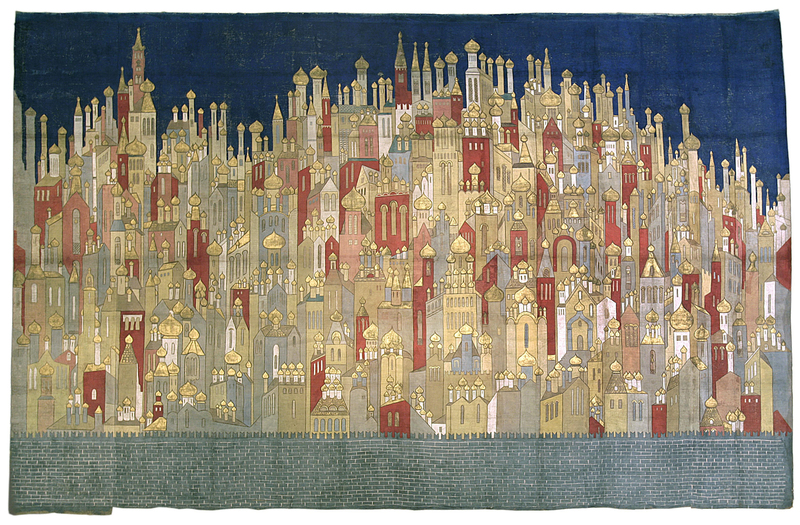 I have loved that Goncharova backdrop ever since I first saw it on the internets, but I had never seen its scale, with people in front of it–incredible! Thanks for providing that link, and for the great post, Lizzie. You are welcome, Karen. I’m glad you enjoyed it. 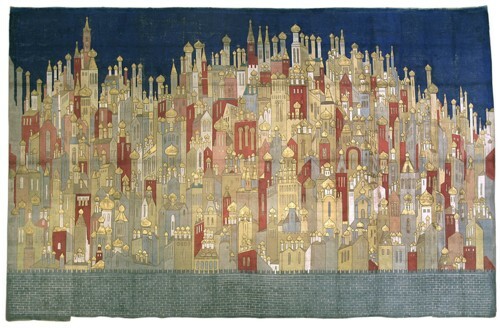 The exhibition also had several of Goncharova’s studies for the backdrop. In this case, size is everything! I too have been waiting for this post–and it was certainly worth the wait! Although it is a long trip from the West Coast, I might just have to make the journey. It would be interesting to know if the exhibition will be traveling to another venue, but I’ve not been able to find out. This really deserves more than just two showings. What fantastical costumes! I forgot that I had a postcard of that Faun costume watercolor over my desk for 15 years. I just loved that image. Thank you for a well researched post, once again. You are so welcome. I could have written a lot more! Thank you for this Lizzie! I sent this to my mother, who teaches Russian politics! Wow. Wow. Thank you so much! Thank you for taking the time to get the wonderful photos from the press office. I saw the exhibition at the V&A, but that seems ages ago now. You are most welcome. I’m glad you were able to see this wonderful show. Hello, I have several original costume drawings that are quite magnificent in a folder titled St. Petersburg Ballet. They were acquired at a garage sale many years ago and have been sitting. They are #, some signed, some named. Spirits of Siam, Queen of Scots, and more. Could you direct me possibly to where I could show them as they I believe are from the 1920’s. Steinberg is on bottom right of one. They are absolute originals with jewels, vibrant colors and breath taking to see. I would appreciate any direction as I’ve never done anything with them.